The length of period a gaijin has spent living in Japan can be measured in futons, according to one groundbreaking study. The study concluded that gaijin will purchase one new futon about once a year and place that futon on top of its old stack of futons. “We can now confidently estimate that any given gaijin would have survived in Japan for around 16 months per futon layer within a margin of error of 1.7 months,” says lead researcher Hiroki Takeshita. The futon directly underneath the new futon provides around 10 per cent extra softness however there has been no scientific evidence to date proving that a secondary underlying futon can offer any form of extra elasticity. “Gaijin are under the constant illusion that stacking futons will boost the softness of the top layer futon,” says Takeshita. Researchers discovered that the gaijin was oblivious to the lack of extra elasticity provided by the lower futon layers and would often come up with a range of justifications for the practice of futon stacking other than they just don’t want to have to pay any disposal fees. “I’ve been living in Japan for a total of 7 futons and I can now use my fridge as a bedside table,” said Cara Smith. 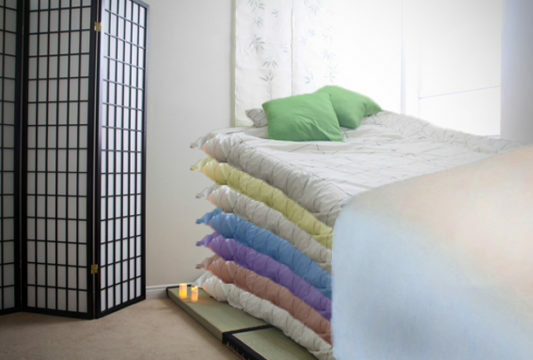 Researchers found that the measurement of futon stacks is only useful for gaijin living in Japan under ten years. “Usually after a decade the gaijin realizes it can buy a mattress and put it on the floor – the mattress doesn’t have to be bashed outside every week, maintains premium levels of elasticity for years, and is relatively a much cheaper buy,” says Takeshita.